Le Vieux Castillon has been in operation for some time but now a tasteful renovatio has given it a new life and made me notice it! This luxury hotel with heated pool in Provence also gets good points for keeping it warm in October! Reviews are really good with people noting the exceptional setting, the good restaurant with a young chef doing wonders, a breakfast buffet with plenty to choose from and a very relaxing spa. 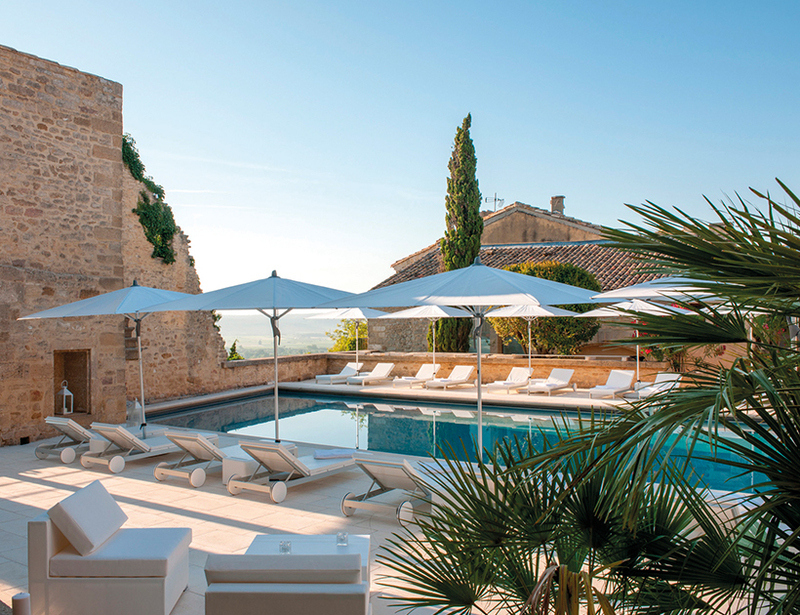 Many of luxury hotels in Provence are outside of villages or towns but le Vieux Castillon has this unique quality of being in the middle of an authentic provencal medieval village. Lots of typical streets that you will want to photograph. The architecture is quite unique too as the hotel is actually eighteen medieval homes, linked through time by walkways, massive steps, suspended bridges or shaded patios, hosting 34 rooms. The renovation has brought in outdoor furniture by GanDia blasco, touches of very contemporary elegance in the interior decoration of rooms and common areas … It’s all tones of muted beiges and whites with sometimes some touches of green or blue. Junior suites can accommodate 4 people so would be good for families. Rooms might be not as pretty as the common areas but given that you’ll hopefully have sun, you probably will spend more time outdoors than in your room. You can choose to eat at the gourmet restaurant, relax by the pool or have a treatment in the spa. Above all, you’ll be really well treated as everybody says that their service and staff are great. With prices starting at 117 Euros in May, this seems to be a nice option if you are looking for Provence hotels or a luxury hotel in Provence. Le Castillon du Gard is close to Nimes and Avignon, where you can get by train or flights. It’s better to have a car to get around Provence but if you don’t have one and will just stay at the hotel, a taxi can do the route, it’s only half an hour from Nimes or Avignon.